I made this for dinner a couple nights ago. This is just a typical garden salad; mixed Spring greens, cucumber, radish, tomato, carrots and avocado was added right before serving. The main course is below. 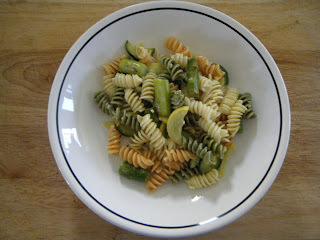 This is the Asparagus & Pasta dish, recipe follows photo. 1. Cook pasta according to package directions; drain and keep warm. 2. Meanwhile, melt margarine in a large skillet; add asparagus, squash, and garlic. 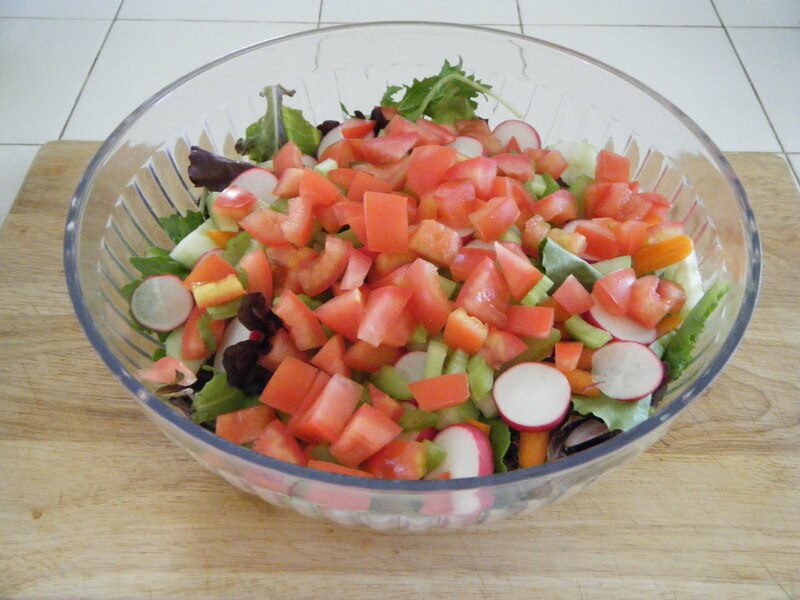 Cook, stirring frequently, for 2 to 3 minutes or until vegetables are crisp-tender. Remove with a slotted spoon and add to pasta. 3. Combine whipping cream and lemon peel in skillet; bring to boiling. Boil for 2 to 3 minutes or until reduced to 1/3 cup. To serve, pour cream mixture over pasta mixture; toss gently to coat. Makes 4 servings. 4. *Note: One medium zucchini or yellow summer squash cut into 8 pieces may be substituted for the baby sunburst squash and/or pattypan squash.